Moving is a sensitive issue for the kiddos, especially when it comes to their bedrooms. In fact, your children may be feeling the same nerves, anxiety, and stress about the move as you are. After all, they are about to transition into a brand-new environment. This can be a big concept to grasp. A great way to make them more comfortable is by packing the kids’ rooms mindfully and playfully. Children feel ownership over their belongings, so make sure you communicate very clearly what’s going to happen throughout the moving process. You’ll pack everything in boxes, put them on a truck, and bring them to your new house. Assuage their fears by reminding them that you’re not packing up your things forever. They will get them back! And don’t forget to pack a last-minute box containing their absolute favorite toys and necessities. This box needs to be easily accessible when you reach the new house. As you’re packing your children’s rooms, find ways to involve them in the process. This will vary depending on their ages. For example, little ones can decorate the moving boxes, and older ones can help decide what they want to donate. 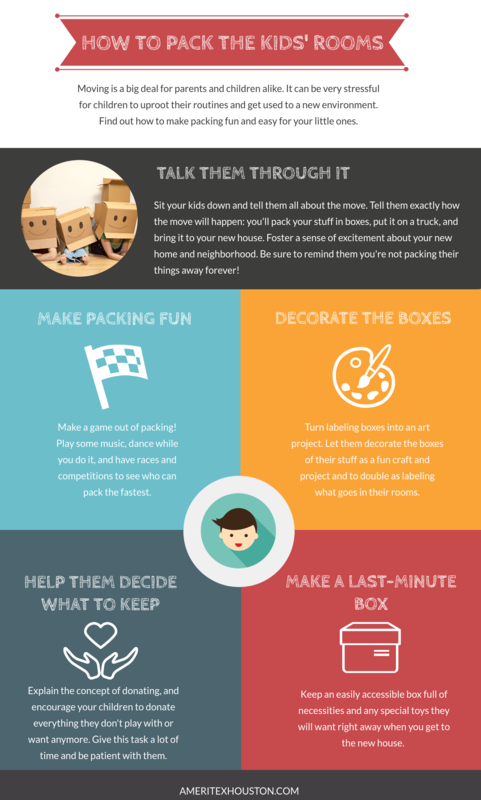 Check out the infographic below for some more ideas on how to make packing the kids’ rooms fun and stress-free for everyone. Need Moving and Packing Help? Another way to remove the family’s stress from packing and moving is to hire professionals. At Ameritex, we offer both full-service moves and a la carte moving services. We can safely and efficiently pack all of your belongings, transport them to your new home, and unpack and set everything up. We’re here for all of your moving needs. Fill out the form above for a free quote.